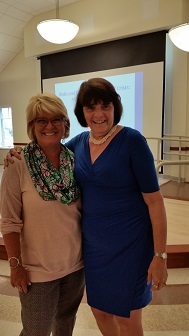 Marlborough – Middlesex District Attorney Marian T. Ryan gave an informative and enlightening presentation on the risks of opioids at the Marlborough Council on Aging at the Senior Center, July 11. Also at the meeting were State Representative Danielle Gregoire (D-Marlborough), Mayor Arthur Vigeant and Chief of Police David Giorgi, who spoke about the importance of educating ourselves on this important topic. Trish Pope, executive director of the Council on Aging, welcomed speakers and seniors to the event. Seniors were served lunch, and received “File of Life” refrigerator magnets and personal wallet cards. These cards list medications, medical conditions, health insurance and other information helpful in a medical emergency. Call District Attorney Ryan’s office at 781-897-8300 for information on how to obtain the cards. Opioids are medications prescribed for pain and include oxycodone (Oxycontin, Percocet), hydrocodone (Vicodin), Fentanyl and methadone. Street drugs such as heroin and cocaine are also opioids. They can be dangerous or deadly: even when taken as prescribed they can have serious side effects, such as depressing breathing and death. Mixing them with other medications and alcohol can increase the death rate. Death rates from opioids have more than tripled in the U.S. since 1999. In Massachusetts state troopers responded to 800 fatal overdoses – 10 of them in Marlborough; 60,000 people were brought to emergency rooms with overdoses. Many were women of childbearing age, some pregnant, who went on to give birth to addicted infants. Most people who take opioids for severe or chronic pain – such as cancer survivors, do so safely under their doctor’s supervision. Because opioids can be addictive, some people become tolerant of the drug and start taking higher and higher doses or taking it more often – they feel “high” or euphoric. They become hooked on them because opioids also reduce anxiety. Things get out of hand and they turn to street drugs like heroin when they can’t get a prescription refill, or they find creative ways to get more pills. This includes borrowing pills from a friend or family member, or finding ways to get them from grandparents or other seniors. The addiction can be so strong that the whole day can be devoted to getting more of the drug. Theft by pharmacy employees who keep two or three pills from each prescription. There are 34,000 grandparents in Massachusetts raising grandchildren, a 20-percent increase since 2005 – in four out of five times this is due to heroin use by the parent(s). What can you do to ensure that you don’t become a statistic? When you get a prescription filled, know what the pill looks like – in the pharmacy, online or in a library the Physician’s Desk Reference (PDR) will show the pill’s color, size, and identifying letters or numbers on it. You can also ask the pharmacist. Count the number of pills when you get home and notify the pharmacy if the count is incorrect. Don’t keep medications where they are easy to reach, put them away. If you have to remember to take them, set an alarm. Know the signs of addiction in family members or anyone often in your home: a change in eating habits, constant scratching, always wearing long sleeves, pills missing (finding out you are short of pills before the next prescription). Also teaspoons missing (used to heat drugs) and aluminum foil (used to wrap drug powders) missing are signs of a drug user. Don’t keep medications where house cleaners and workers can easily get them. If you don’t finish an opioid medication, discard it – but not down the drain, toilet or in the garbage. The Marlborough Police Department has a prescription collection box or will pick it up if you can’t bring it in. Call 508-485-1212, ext. 36966. Even non-opioid medications like heart medicine or “water pills” can cause harm to children, pets or the environment.